For the ebooks, if you have an ebook reader (like the Amazon Kindle, Barnes & Noble's Nook, Kobo etc.) then download the books onto them for the best reading experience. In case you don't have a reader, you can use a ebook reader app on your desktop/laptop/tablet/mobile (you can get the apps from the app store - just search for ebook reader; there are many like the Kindle, Nook, Kobo, Aldiko etc.) Once you install any of these apps, then you will be able to open epub files (most commonly supported ebook format) or the mobi file (used by Kindle). 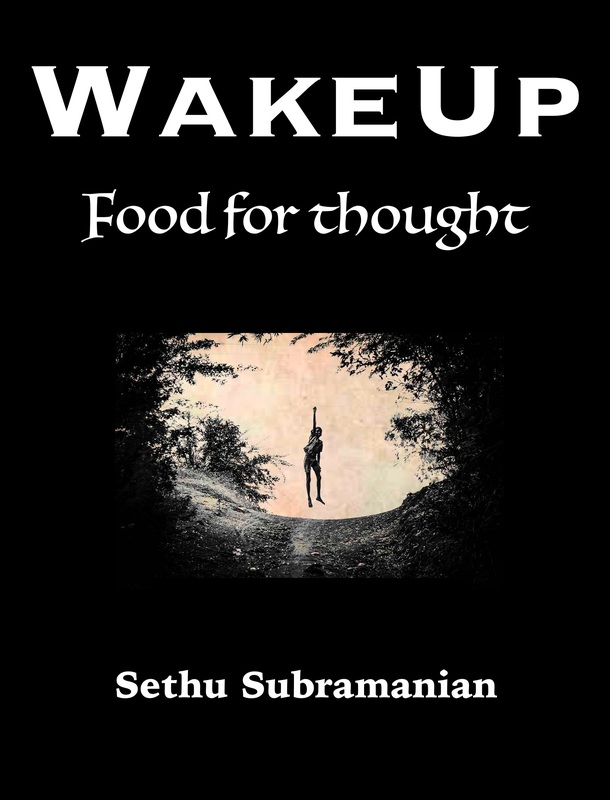 My first fiction novel released as an ebook. Print edition will follow later. College story. Boy joins college. Girl joins college. Boy and girl see each other for the first time. Both fall in love. Then both fight a little. Both make up. And finally both live happily ever after. Really? That's not what happens often is it? Moorthy joins college. He becomes close friends with Deepu, a strange student with peculiar habits. He wonders what drew him into the friendship? Moorthy doesn't believe in love but he sees a girl and starts liking her. He is confused about what is love? Moorthy gets thrashed by seniors for no reason. He wonders what he did to upset them? As Moorthy unravels the mysteries, his friendship is tested and so are his beliefs. Experience jealousy, hatred, despair and hope through the eyes of two students - one who is struggling hard to break the ice with the first girl he's ever liked; and the other who is desperately trying to hide his past for fear of lapsing into depression and fear of friends. 2 teenagers; 2 perspectives; one questioning love and the other questioning life. 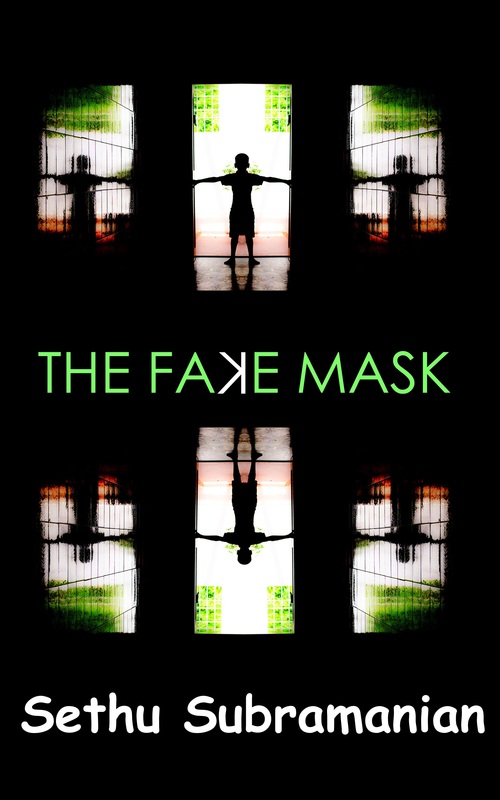 In case below link doesn't work, just go to the main site amazon.com and give a search for 'The Fake Mask'; you will find this book. I'm trying to keep the book only on Amazon so that I can try out their KDP Select Program. Amazon/Kindle (US) For other countries Amazon will redirect you to the respective country website and there in the search box you can give 'The Fake Mask' to locate this book. You can download a sample pdf of the novel here (contains first 6 chapters) Samples are available on the other stores as well. This is a free ebook so please download it, check it out and drop your review comments on your favourite online retailer. A collection of poems and short articles to make you ponder about life. A lot of times when we feel low, reading encouraging stories or thought provoking articles helps lift our mood. Maybe right now you are feeling sad or wishing that life could have been better or maybe you are happy; whatever your state, hopefully at least one of the topics in this book will strike a chord with you; hopefully at least one of them will make you feel optimistic in life. Written based on a variety of subjects - an old man sipping tea, the craze of love, thoughts from a girl’s view, the desires we chase, the mask we wear, our wavering mind, enthusiasm of a young kid, perseverance of a baby, our violent nature, commitment to our work, our addiction to social networking, not getting rewards for our efforts, worst form of punishment, life without technology. You can download a copy from any of the following channels. If you have a ereader device then download from the respective store for that ereader. If not, you can install an ebook reader app on your computer/tablet/mobile (like the Kindle, Nook, Kobo etc.) and open one of the file formats available in the Smashwords link below. Also available on Google Play Books, iBooks, Flipkart and other online retailers. I was searching for an alarm clock app that would start a video to inspire me to get out of bed... but didn't find any. There are alarm clocks that can play audio and launch other apps but nothing that plays video directly. So I created this add-on app. Install an alarm clock app (like 'Alarm Clock Plus') and then install my app (titled 'WakeUp Alarm add-on'). Once downloaded just click on it in your mobile and it will auto install. Set the video you'd like to play in my app. In Alarm Clock Plus, set the alarm to 'Launch App' and link it to 'WakeUp Alarm add-on'. That's it - you are all set. 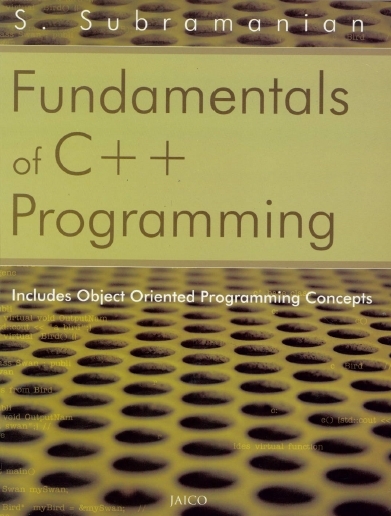 Based on the C++ tutorial that I have in this website I wrote a book that has been published "Fundamentals of C++ Programming" by Jaico publishers in India in 2009. Learn about ‘why’ and ‘how’ certain things work the way they do in C++ programs. Some questions highlighted below. One chapter exclusively on Q&A. More than just C++ - touches upon Linux and shell programming which help understand certain areas of C++ better. Increased coverage of pointers and Object Oriented Programming (OOP). Starts with explaining programming jargon (linkers, loaders, assemblers, bits and bytes) before jumping into C++. Updated: content has evolved over a period of 6 years based on readers’ suggestions on the online tutorial. 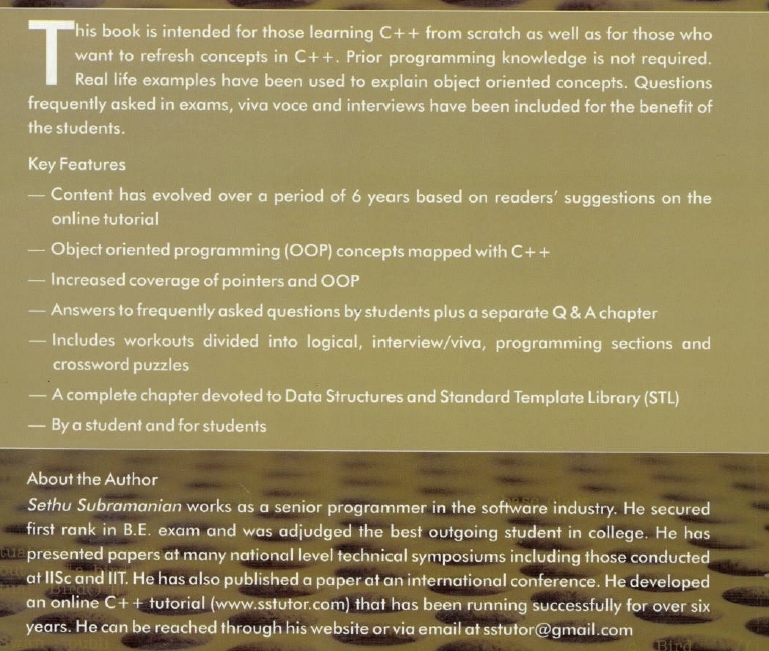 Covers school and college syllabus for C++. C++ is fun to learn: Workouts at the end of every third chapter that contain crossword puzzles and interview questions. Data structures: a complete chapter devoted to data structures and Standard Template Library (STL). By a student and for all students. What is the difference between a linker and a loader? Why do we use int main( ) instead of void main( )? What is the use of “return 0”? Did you know i---j and i- --j are different? Is accessing via pointers faster than array indexing? What is data hiding and who are we hiding it from? What are the various relationships 'isa', 'hasa' etc. and their C++ equivalent? How does the program know which function to call at run-time? How are virtual functions implemented? Why is the 1st dimension not required by a function when a multi-dimensional array is its argument? Is it useful to make a function private in a class? If cout and cerr are both used for display, what's the difference? What is redirection? How can I access the printer from a C++ program? What does binary mean with regard to file handling? When overloading the assignment operator, why should we return by reference? Are there alternatives?